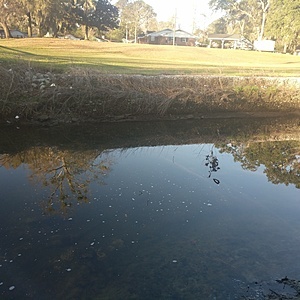 Large amounts of pollen and debris in and on surface of water. Sheen on water surface. Whitish and soapy looking. Recent Rain. Lots of debris, slight sheen on water. Recent rain. Sheen on top of water. High water level very vegetated. Light film on creek. Wind pushing flow upstream. Potentially rising tide. 7.93ntu. Turbidity - 4.39 NTU from Hach 2100Q Turbidimeter. Smell of sewage/decaying organic material in air. Other details: low water level, relatively slow flow, cold sunny morning. 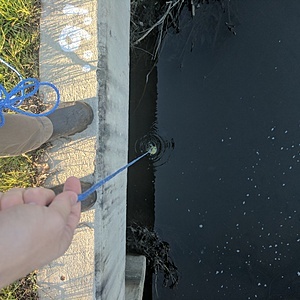 A more than 15,000 gallon sewage overflow was occurring when sampling took place. Several inches of rainfall had occurred in past 24 hours. East Bolton Branch at Navco Road. 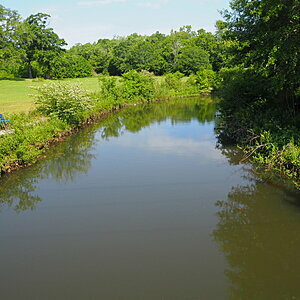 Channelized stream, faces significant impacts from urban stormwater runoff, Sanitary Sewer Overflows (SSO's), litter and sedimentation (See Reynolds, 2008 - http://goo.gl/ULwUC1). More than 75% of the watershed is characterized by urban land cover. 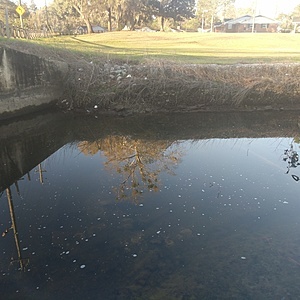 The creek was listed as an impaired water due to pathogens (bacteria) in 2004 based on data collected by MAWSS as a result of the Supplemental Environmental Projects (SEP) required by their consent decree with Mobile Baykeeper. A Total Maximum Daily Load (TMDL) - http://goo.gl/8g0eSO was prepared by ADEM for the creek to aid in reducing impairment due to bacteria in 2009. 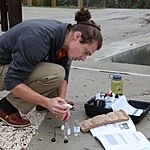 From the sample site the creek travels approximately 0.5 river miles to the confluence with Eslava Creek. Drainage area at sampling site is 1494 acres. Bolton Branch drains into Eslava Creek which is a tributary of Dog River. Sampling site is on North bank of stream, use caution as there is a significant drop from the parking lot above to the stream bank.